Chalk & Notch’s Pixie Tee is as great in woven fabric as it is in knits. Metallic Kaufman linen and Art Gallery cotton for the lining. LOVE. I added a little something to the back of this Cheyenne. 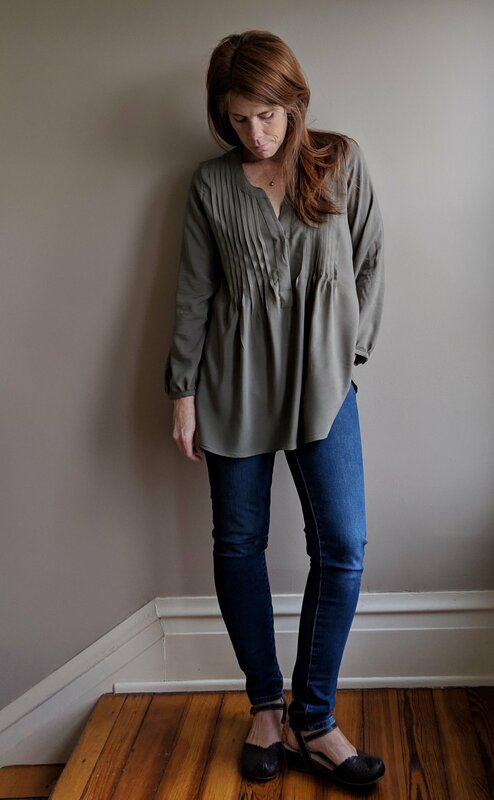 All the details, my favorite tools for sewing button-ups, and my tips for success are in the guest post. Another Pixie tee hack, this one for cooler weather. So cozy and very simple to add a cowl. Gabriela even has a downloadable reference for the mods. Pleats make everything better! Right? 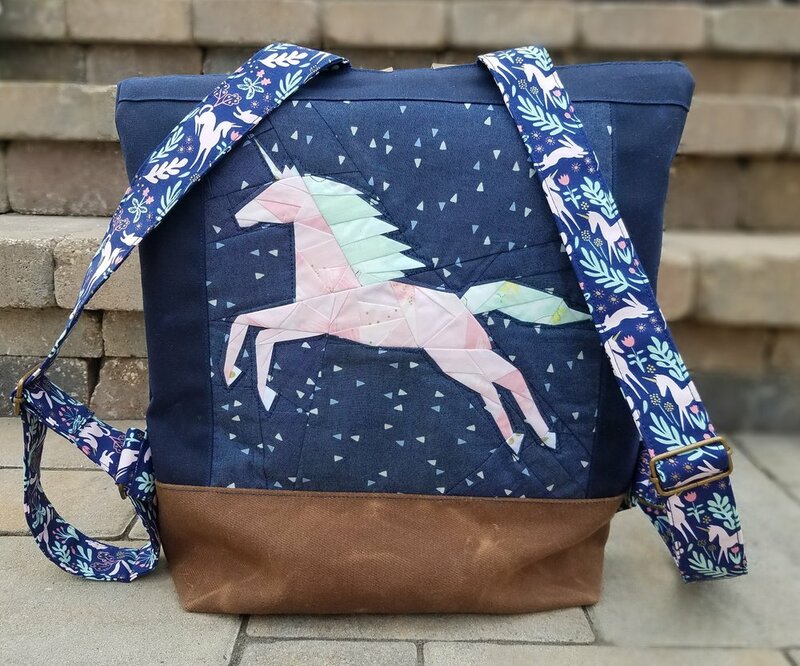 Back in June, I saw Jessica Swift's call for sewists to create and share bags showcasing Sirena. And when Jessica calls, I answer. I also sew all her clothes. Ok, not ALL her clothes, but I did make her a dress once. And that dress even got to vacation in Mexico! Last day in Cabo, sitting on the porch in my #agfsirena #fringedress made my @havinsewmuchfun. I love it here! Ahhhh. Sirena. It exudes summer with every fiber. Perfect for summer totes! Great idea, Jess! I instantly knew Jessica's call was just the excuse I had been looking for to finally make a Noodlehead Poolside tote. It's a generously sized bag with plenty of room inside for several towels, especially when you aren't rolling them nicely for modeling sake. I used AGF solid in Grapefruit for the lining. And that splendid facing? A Squared Elements print in Lox. Everything coordinates so well! With only one exterior pocket, this tote begged me to make it a zippered pouch companion. You can't put sunscreen on the kids if you can't find it in your enormous tote! Spy a little friend? That sweet mermaid enamel pin is the product of a collab between Jessica and Maker Pin Co. She's also the impetus for the fishy friend on the pouch. 'Fishy Bones' is a free foundation paper piecing pattern by unicornharts; available here. Did you spot the other little accents of Tallinn fabric? Magija Pumpkin coordinates so well it's hard to believe it isn't part of the Sirena collection. So yeah. I'm not actually taking my Poolside to the pool (have you seen how many kids I have?). But I love my new summer tote, nonetheless! Thanks, Jessica! The fabric used for this post was provided by Jessica Swift and Art Gallery Fabrics. With summer winding down, school prep is in full swing. My kids attend a school with a uniform policy, so sewing their school clothes is something I have very little desire for. I decided I'd be up for making their backpacks, though, especially since there's so many beautiful Range Backpacks on social media. I would have made one for myself already (read: I LOVE NOODLEHEAD PATTERNS), but it's just not a style I would carry. With my son entering first grade, the teacher specified that the bookbag should be large enough to hold full-sized folders. The pic below shows the popular brand toddler backpack like my son had been using (center). A standard folder (right) fits width- and height-wise, but the folder has to be bent to close the zippered top. In considering the Range pattern, which is scaled for adults, I was concerned it would be too large for an elementary school kid, but I think the picture also shows it's not a huge jump. And kids only keep growing; you just have to feed and water them somewhat regularly. 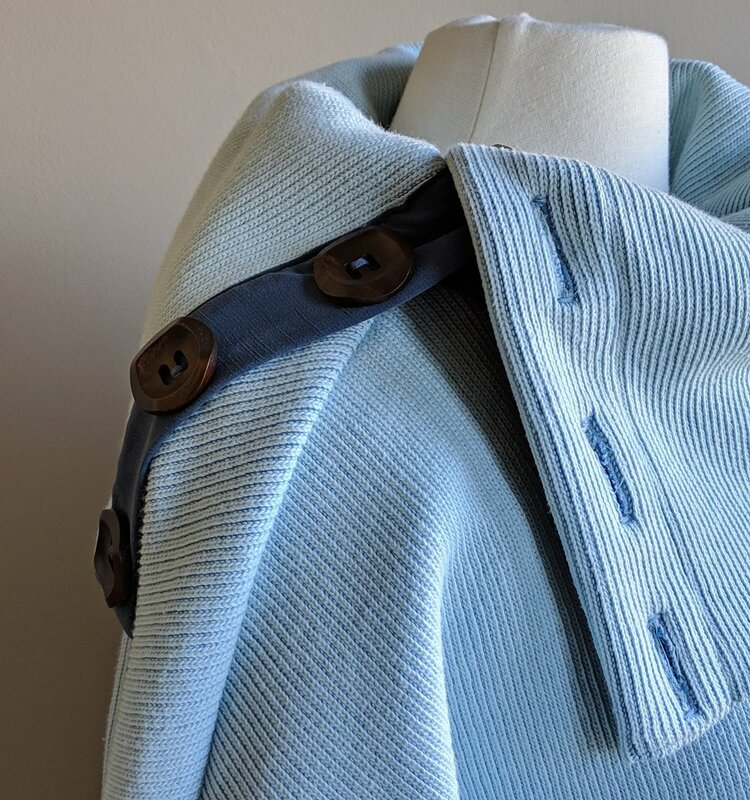 I chose waxed canvas for the exterior fabrics because, hello, it's gorgeous stuff, but also it's sturdy (no need to interface it) and the wax affords some water resistance. I had no previous experience with the stuff and picked it out from fabric.com without getting swatches first. I was somewhat surprised when it came on a roll. I shouldn't have been surprised, though! I'd heard that waxed canvas can easily be marked by folding. You also don't want to use pins with it as the pin holes will persist. You can use pins carefully within the seam allowances or alternatively use clips. I did find clips could leave marks too, if they got dragged across the canvas, but this was generally on the inside since we typically seam with right sides together. I found there was a wide range of weights for waxed canvas (of course there are!) and that it's rather pricey (double of course). Again, I ordered on faith, really, picking one that was 13.7oz/ sq yard (navy) for the main and an even heavier weight (27 oz!) for the contrast bottom (brown). I can happily report these were good choices and the brown is rather leather-like. I'm so glad my son agreed to this fabric, a Spoonflower print- 'Old Friends' by lellobird. Turns out I don't have many "boy" choices in my stash. This was actually scraps from a commissioned duvet last year. I discovered I liked using my zipper foot for top stitching. I did not bother to use my walking foot, which is often recommended for bags and for working with waxed canvas. Honestly, I kinda despise that clunky thing. A denim needle worked fine and I only broke one. 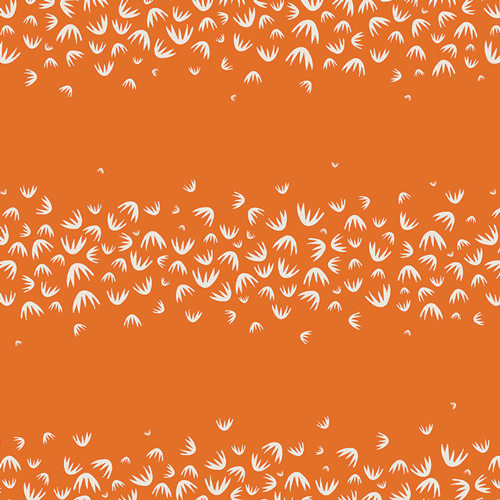 I think that had more to do with the coarse Spoonflower fabric than the canvas. What else can I tell you about waxed canvas? It doesn't strike me as waxy/sticky (just stiff), but it really does seem to collect lint (and likewise, dog hair). Ok! Here it is. The most amazing thing I've ever sewn. My daughter picked a print with unicorns (actually a leftover also!) by Sarah Jane. I wanted her backpack to be extra special. 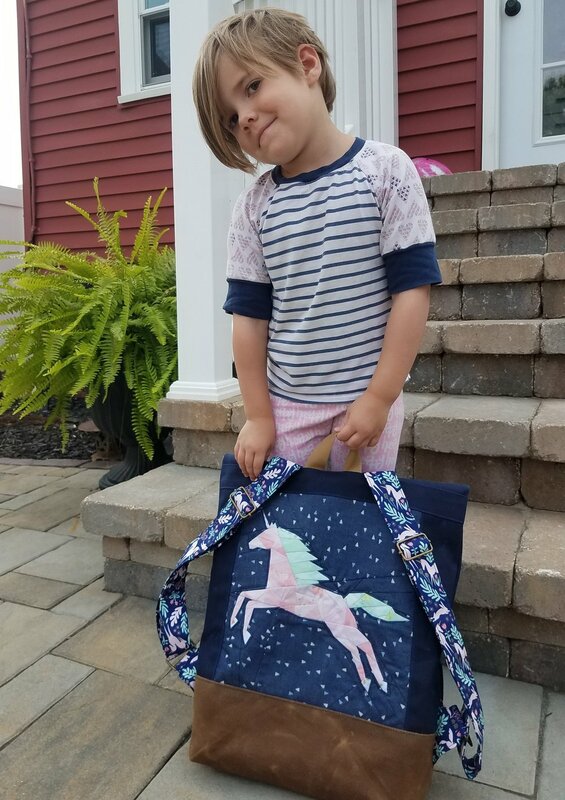 This spunky kid loves expressing herself through clothing and now she's slated to wear uniforms. Extra flair was in certainly in order for her backpack. 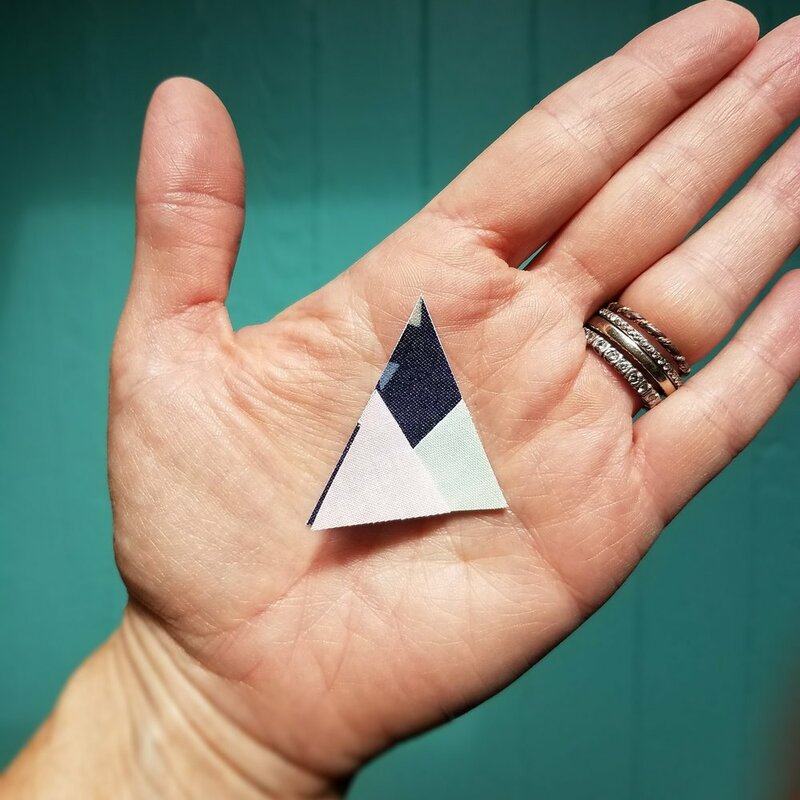 I found a foundation paper piecing pattern by Quiet Play, Geometric Unicorn. This block finishes at 12". Which I guessed was just right for the area on the back side I wanted to embellish. It wasn't until I made my son's Range that I realized this space was closer to 11" wide and 10" high. 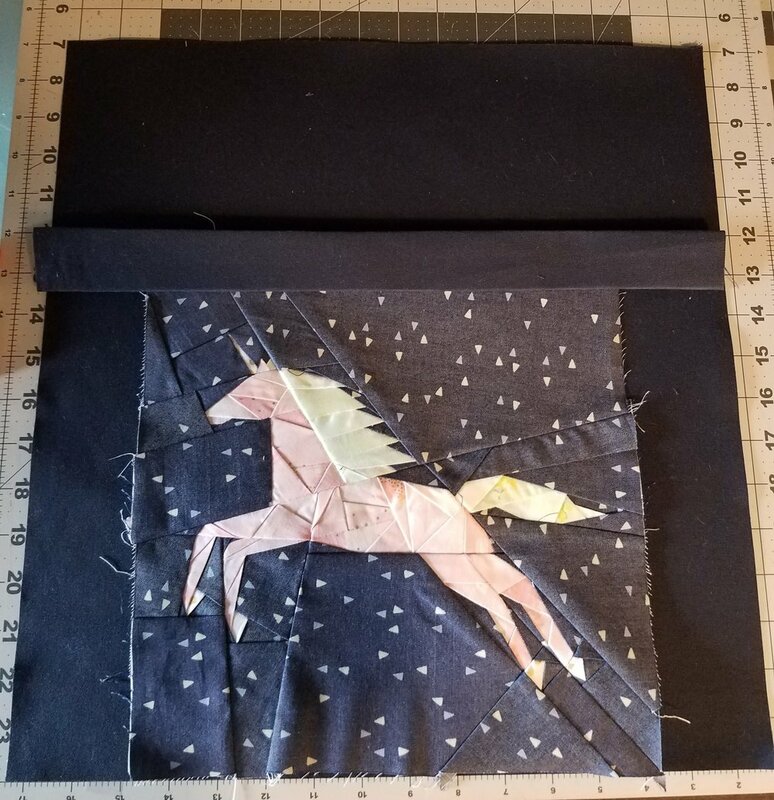 I scaled the unicorn down to 85%, leaving a 1/2" seam allowance at the border. It only looks complicated. You just take it one section at a time. I stabilized the panel with fusible interfacing then framed the right and left sides with waxed canvas pieces before adding the bottom contrast panel and strap reinforcement strip at the top. I wasn't in love with how much the lining peeked out on my son's version, so I decided to add a 1" facing on my daughter's bag. What's also nice about this finishing method is that you can completely sew the lining together. No need to leave an opening to turn through and close afterwards. I picked apart my son's bag and gave it the same treatment. I shortened the straps by 6 inches on both bags. At their shortest, the straps are a good length for my kids and still adjust to a comfortable length for me. The only other departure from the pattern was the closure. I wanted to use Anna's mod for a side release buckle, but I couldn't find a source for any I liked. I went with the popular alternative, swivel clasp and ring. 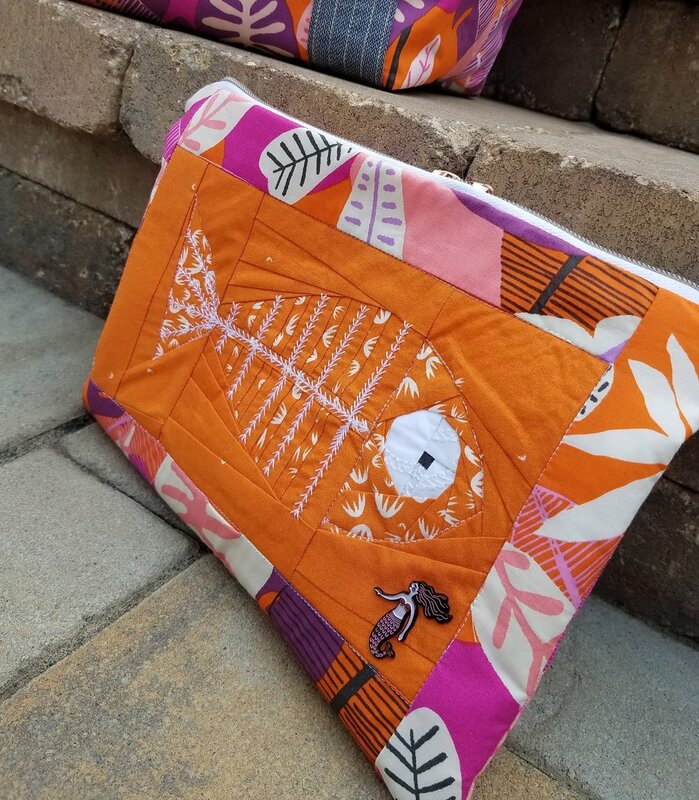 I hope you feel inspired to sew a Range Backpack or two! I'm sharing the bag I made for April's #letssewthistogether. If you know me, you know it's extremely rare for me to buy paper patterns. It is easy to make an exception for bags or other one-size items though! I had received an incredible upholstery remnant from Erin, The Machine (@vinthillknits) and I knew instantly it would make a lovely bag. 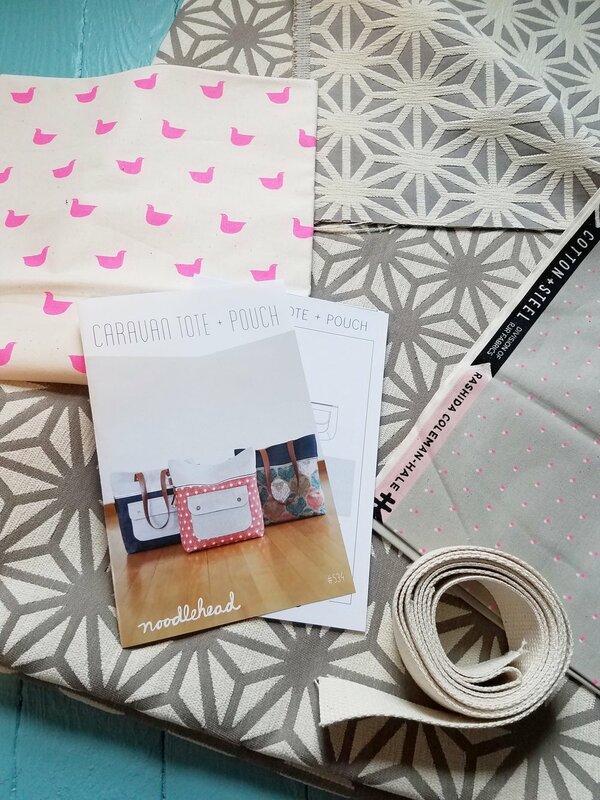 I chose the Caravan Tote pattern by Noodlehead after drooling over a sample at Sew To Speak. Truth is zippers work better with pulls. It came together rather nicely! 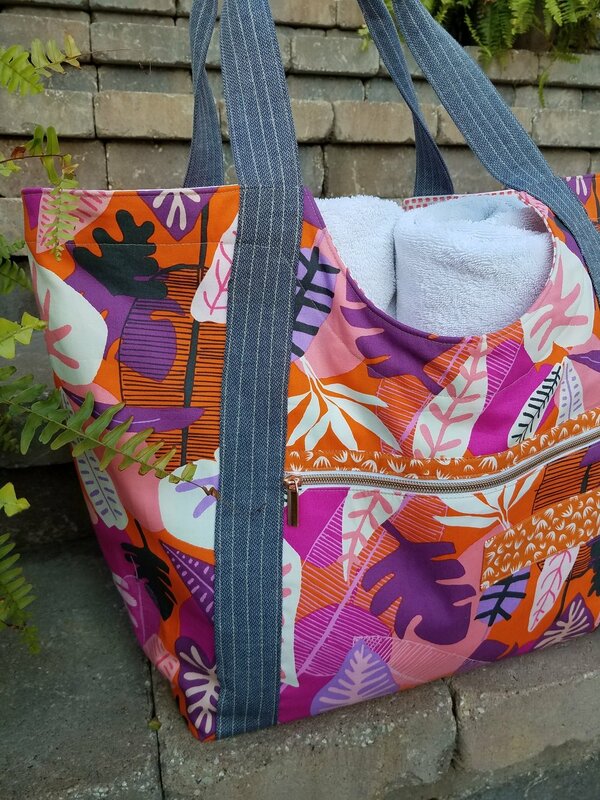 My favorite feature of the Caravan Tote is the large outer zippered pocket. It's designed with storing needles in mind. I chose to stitch a few larger slip pocket sections since I don't knit. The rivets at the base of the shoulder straps were an ad lib. A little extra bling never hurt anyone, no? I added my tag inside the pocket flap on the front. Since the outside is all shades of greige, I love the pops of bright pink in the lining fabrics (Cotton and Steel). All in all, I'm happy with this tote and would definitely sew this pattern again.